Hay & Forage Grower will feature the results of research projects funded through the Alfalfa Checkoff, officially named the U.S. Alfalfa Farmer Research Initiative, administered by National Alfalfa & Forage Alliance (NAFA). In January 2017, the NAFA board of directors began the checkoff program to facilitate farmer-funded research. Implemented voluntarily by seed brands, the checkoff is assessed at $1 per bag of alfalfa seed sold with 100 percent of the funds supporting public alfalfa research. It supports research into the improvement of yields and forage quality, agronomic management, feed value consistency, new uses and market development, fertility, soil management and health, and other research areas holding the potential to advance the alfalfa industry. The first project results are just being completed and detailed reports can be viewed on NAFA’s searchable research database at alfalfa.org. Traditionally, tedders have been used after mowing to help speed drying rates prior to baling. The best mowers are at about 70 percent cutting width, so tedding makes use of an extra 30 percent of the sun’s energy, said Matthew Digman, an agricultural engineer at the University of Wisconsin-River Falls (UWRF). 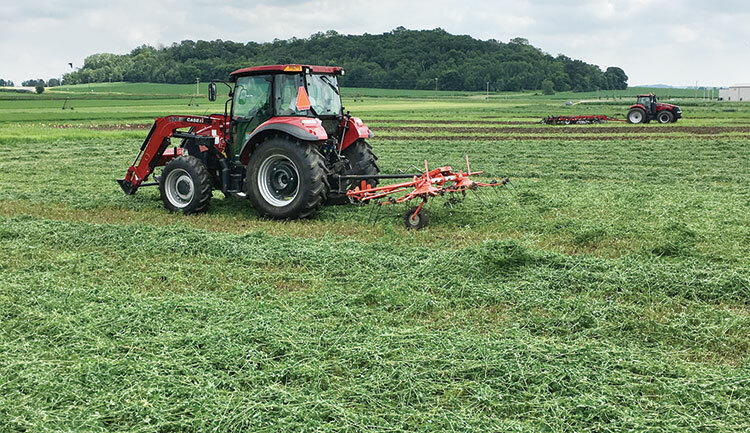 When forage harvesters told Digman they were tedding to speed the drying of alfalfa silage, he wondered if that practice would improve forage quality and if it was cost-effective. He applied for, and received, one of the first of nine projects funded by the Alfalfa Checkoff. That funding also allowed Digman to get a UWRF student involved in agricultural research. He selected Lindsey Murry to assist on his project. Murry coordinated the study comparing the quality of tedded and untedded alfalfa on three cuttings in May, June, and July 2018, at the UWRF Mann Valley Farm. Samples were analyzed for quality using near-infrared reflectance spectroscopy. Levels of crude protein, neutral detergent fiber (NDF), water soluble carbohydrates (WSC), ash, and total digestible nutrients (TDN) were measured. Averaged across the three cuttings, tedding did speed drying to a moisture content of 51 percent versus 62 percent for untedded alfalfa. But crude protein dropped, NDF rose slightly, and no difference in TDN was observed. Water soluble carbohydrates, which help improve fermentation and silage quality, were higher but the levels in both treatments were in an acceptable range for good forage based on previous research. “At this point, those under tight harvest windows can possibly justify the cost of tedding alfalfa for silage if you’re running a real tight ship and you want to speed harvest time,” Digman added. “I worked to develop a decision tool for producers where they can model the cost of the different operations, and I think that’s the biggest takeaway from this research,” Murry said. Her spreadsheet, which can be used on Windows operating systems, allows farmers to enter their own equipment and then calculates the costs of different field operations on a per-ton, per-hour, and per-acre basis. It can be found at bit.ly/NAFACostTool. Shinners and his research design team are working on a tedder that will operate at higher speeds than traditional tedders but be gentler on alfalfa plants and produce a more uniform crop mat. • Provide a learning opportunity for undergraduate agricultural engineering students in forage systems. • Study the impact of tedding on the economics of alfalfa silage production using the USDA’s Integrated Farming Systems Model (IFSYM) and compare the results of the model to field observation. • Determine field operating costs and efficiencies of modern tedders and summarize results into a decision tool allowing producers to determine if tedding fits into their operation. • Field trials showed tedding alfalfa before harvesting for silage, using tedders currently on the market, may be cost-effective for large, efficient harvesters with narrow harvest windows. The added field operation costs otherwise outweighed the small quality advantages. • A decision-tool spreadsheet for producers was developed to determine the costs of tedding as well as other field operations. This article appeared in the February 2019 issue of Grower on pages 20 and 21.